While we weren’t looking, a major new market has developed. It could be the next big thing for clean energy in the U.S. It's the market for green bonds. Especially exciting are the bonds being promoted by Green America, Clean Energy Victory Bonds. Clean Energy Victory Bonds (CEVBs) aren’t available yet. They’re proposed U.S. Treasury bonds that will fund clean energy programs supporting wind, solar, energy efficiency, and electric vehicles. In addition to financing the production of innovative technologies in the U.S., CEVBs will extend proven programs like the Investment Tax Credit (ITC) for a decade. Now, that’s huge. All over the country, renewable energy advocates have been fretting about what will happen when the ITC runs out at the end of 2016. Extending it would provide a welcome boost to solar and other clean power sources. What’s more, any American will be able to invest in CEVBs, for as little as $25. That distinguishes them from other green bonds. As Todd Larsen of Green America notes, “Clean Energy Victory Bonds are different in that they will be available to individual investors as well as institutions.” And their low barrier to entry “means that all Americans can afford to purchase one.” In other words, the 75% of us who can’t put solar panels on our own roofs will have another way to participate in and benefit from solar and other renewables. Here is a wonderful picture from the rally at the I-5 bridge from Vancouver WA to Portland OR. A flotilla of kayaks symbolically blocked the Columbia River from Oil and Gas exports. I had the pleasure of attending a protest against fossil fuels today on the Columbia River, beneath the I-5 bridge between Vancouver, WA and Portland, OR. 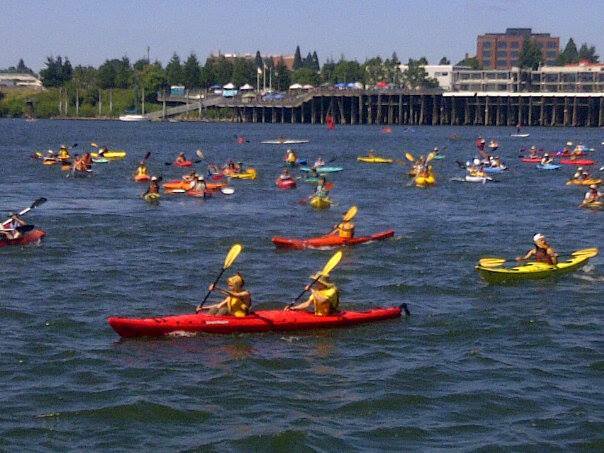 The water filled with kayaks and sailboats as a makeshift flotilla symbolically blocked the river to exports of carbon. 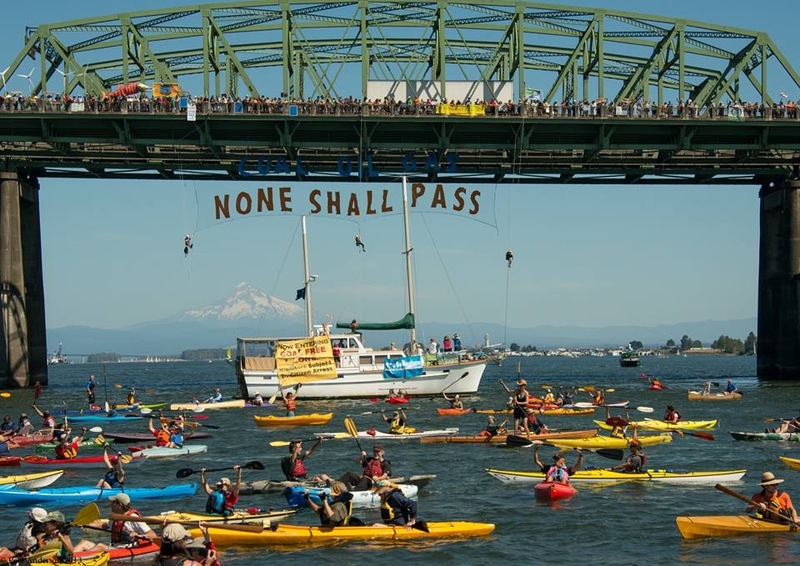 "Coal, Oil, or Gas, None Shall Pass" read a banner that was hung from the freeway bridge. 350.org is encouraging colleges and universities to divest from fossil fuels. How better to reinvest the money than to put it into clean, renewable energy systems! Ownership of onsite solar panels, offsite solar subscriptions, or solar-backed securities can be a haven for ethical investment. The way that money is invested can either make inevitable a climate distater, or can fund the building of a better world. Each Wednesday for four years, Jeanne Poirer stood on a corner with a friend in her small hometown of Cashmere, Wash., protesting fossil fuel exports along the Columbia River. 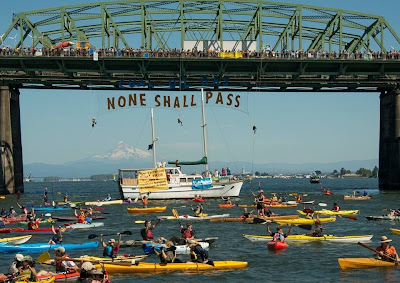 She didn't feel so alone on Saturday, however, as she joined hundreds -- by land and river -- peacefully practicing a blockade of the Interstate-5 bridge and the Columbia River below should exporting begin of coal and other fossil fuels via the river to the rest of the world. More photos can also be found on the event's Facebook page. Seattle City Light and the Seattle Aquarium will install a 49 kW solar array this fall as part of the utility’s Community Solar and Green Up programs. The PV project will cover much of the south side of the aquarium’s roof. City Light says most of the capacity will go to customers who want to buy solar power through its Community Solar program. The rest of the panels are being installed as a demonstration project through the utility’s voluntary Green Up renewable energy program with the electricity supplying the aquarium. Solar panels for the project are being purchased from Silicon Energy of Marysville, Wash.
"Adding more solar to our community’s clean energy portfolio along with hydroelectric and wind power is one more way Seattle City Light serves as a good steward for our environment," says City Light General Manager and CEO Jorge Carrasco. "With this project, our customers now have a new opportunity to directly purchase renewable solar electricity even if they can’t install panels at their homes or businesses." 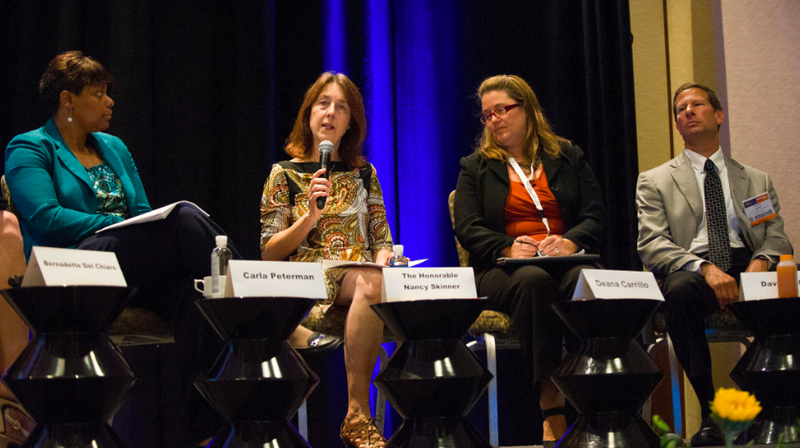 With the solar industry at a crossroads, what will move it forward? Financing and technological advances are necessary ingredients. But a key foundation without which neither of these can thrive is a stable, consistent regulatory and policy environment. 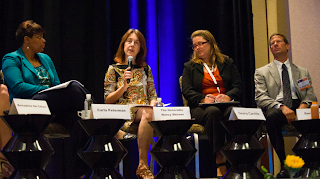 Attendees of Intersolar North America last week had a chance to learn more about how policy affects the industry. When it comes to policy, people tend to play favorites. One very vocal and persistent gentleman showed up at several panel discussions to promote an aggressive feed-in tariff (FIT). This is the policy that has led to widespread adoption of solar in Germany, not to mention a large percentage of local ownership of solar there. In Germany, FITs are decreasing, while in some developing countries they’re on the rise. There’s no question that they can be robust vehicles for solar adoption. Not all FITs are created equal, though, and they may not be the best choice in all situations. Gary Gerber of Sun Light & Power called California’s current FIT “laughable.” According to Gerber, that’s because it was designed by utilities rather than people in the industry. On the other hand, a successful FIT in LA was born from the roots up. A group of businesspeople reached out to public entities and commissioned a UCLA study to determine the best way to promote commercial solar. The result was a FIT so popular that it sold out in 45 minutes. Similar programs could sprout up in other cities around the U.S.; one in place in Gainesville, Florida, has made that city a solar leader in an otherwise not-so-solar Sunshine State. A key lesson here is that policy, at least in the U.S., works best when implemented at the local level, from the roots up. A good example of this is Community Choice Aggregation (CCA, sometimes called Community Choice Energy), a model that’s spreading locally -- out of frustration that projects aren’t happening. In the CCA model, a community works to reduce costs and bring clean energy to a region. The main feature of these programs is local control. Solar gardens are sprouting in Minnesota. These innovative solar power projects allow electric customers to invest in a large array off their property and own a share of the output, which gets credited to their monthly bills. The first solar garden, a large ground-mounted system, is nearly finished in Rockford, next to the headquarters of its sponsor, the Wright Hennepin Cooperative Electric Association, which says it plans to immediately build a second one. In Minneapolis, start-up company MN Community Solar said Thursday that it expects no shortage of investors for that city’s first planned solar garden atop a business on E. Lake Street. As a New Year’s resolution for 2013, Ellen Honigstock decided to install solar panels on the roof of her Windsor Terrace home. She had recently weatherized her building and wanted solar energy to be her next step toward a smaller carbon footprint and more cost-efficient energy. “When you look around Brooklyn, there’s not a lot of solar,” she says. But when she asked her neighbors if they were interested in solar, she was surprised by the response. “I was just gonna do it on my own house, but I don’t mind doing some of the leg work for my neighbors, and when I put out a note to our local listserve, I got 37 responses,” she says. Bill# 20-0057, also known as the Community Renewables Energy Act of 2013, is a critical piece of legislation that will provide open access to solar power for all of DC residents. Essentially this Bill is a community solar initiative that would permit DC residents to subscribe to a portion of a solar array and receive credit, on their monthly electric bill, for the solar electricity it produces. If this Bill is enacted, it will be the greatest leap forward since the Clean and Affordable Energy Act of 2008. Why is this Bill important? Unfortunately, many residents of DC are unable to use solar energy because they either rent apartments, condominiums, etc. or their properties are just not ideal for solar installation. The Community Renewables Energy Act of 2013 would provide the opportunity and a creative way for more DC residents to go solar. It would also eliminate worries customers have about any operational costs associated with going solar.